Merry Blogmas day 7! If you are like me, I do great on the big presents, but I am always stumped when it comes to stocking stuffers. Do I get them socks? Do I get them candy? I never know! My sister and I do my parents stockings so I’m getting prep for when I have to do my kids! In my family, we normally do a little candy, and a few fun items in our stockings. Nothing expensive-usually less than $5-15 per item. Since I always struggle with what to fill my families stockings with, I thought, “maybe someone else has a hard time too!” So I thought I would give you guys a little help. I’m sharing a few stocking stuffer ideas for her! These are for the girly girl, like me! I share what I know, right? I’m not being sponsored to promote this one this time, I’m mentioning it because I seriously love this stuff. I normally hate bars of soap, but this brand is incredible. The ingredients are so lovely and the bars make my skin feel so soft and fresh- which makes this a perfect stocking stuffer! It helps make any night an at home spa day! Who wouldn’t love special soap to treat yourself with? When I saw this print I couldn’t resist adding it to the list! I mean, I think I’ve probably owned maybe a million bobby pins in my lifetime and I lose them all. Lord knows I am not the only girl who has that problem! Zipper pouches always make a great and easy gift for ladies! I always love having many different little bags to pick from for my lipstick or lotions. You can’t go wrong with this! Candles are my guilty pleasure. I saw these mini candles at Bath & Body and fell in love with them. I would love getting a little candle in my stocking! These mini candles are perfect size for stocking stuffers and they’re super cute of course. There are many different smells if this one doesn’t suit your fancy. And they’re the quality of the awesome Bath & Body without spending $22.50. My mom always usually bought us something like lotion, lip gloss, or chapstick. I loved how adorable this little Burts Bees holiday set was and it’s perfect for a stocking stuffer! The packaging is great as is and even looks like a little ornament. There are also many different “smells” of these too, I just really love pomegranate! Spoiler alert, I have this beanie and I’m glad I have it! I knew I had to include this in my stocking stuffers post because this is such a great little gift. Beanies are a bit of an obsession of mine; I take any that I can get. Five Below has multiple colors available but the maroon one is my absolute favorite. If you have a friend, daughter, mother, etc. who loves hats and beanies-then this is a great and affordable stocking stuffer! If your stocking stuffer hunting for a girl who loves anything cozy, grab these! They’re on Amazon Prime so a very easy buy! I actually got my first pair of these at a hospital, but these slippers are the best there are! I love something a bit thin and comfy like these slippers are- lightweight and easy to wear! I’m sure you’ve seen these tassel earrings are all the rage right now, a pair from Charming Charlies would make a great little stocking stuffer for any jewelry loving girl. Hint, hint to my family, I want these, hehe! I always think a cute pair of earrings make great stocking stuffers. My mom always bought us a pair of earrings or two…nothing fancy but just a cute pair she knew we would love. It’s an easy thing to pick up and stuff in a stocking! What are some stocking stuffer ideas you have? Still looking for the perfect gift? I wish you well in your shopping endeavors! Also, are you enjoying Blogmas?? What has been your favorite post so far? Yes! I myself am pretty picky and have expensive tastes sometimes, so guilty!! That’s why stocking stuffers are a great thing! These are such great ideas. I’ll definitely buy some for my family and friends. I LOVE that hat! And the earrings! Those are my current favorite colors to wear, everyday! Such perfect stocking stuffers, going on my list! ahhhh this was perfect. Stocking stuffers are what was left on my list, and this helped me out so much! I still need to get started with my christmas list!!! Thank you so much for the great suggestions! I think my sister will love some of these items! Sending this blog to my husband right now 🙂 Such great ideas!! Can’t go wrong with chapstick stocking stuffer — perfect for dry winter weather. A great affordable list! Now this is the kind of stocking I would love for myself! I think each of these items are simple yet useful and even a great (always love candles). We add cute Lip chapstick and colorful art supplies. Great ideas! Happy Blogmas! These are perfect little gifts for stocking stuffers! My wife would love these. These are all great stocking stuffer ideas! I’d love so many of these items myself. I love that beanie! Like everyone else, I just forwarded this to my husband! All of the items are perfect stocking stuffers! Such perfect timing to see this!! Right in the middle of Christmas present buying, and this gave me some inso. I especially love those slippers and beanie, Thank you!! I totally get stuck on the stocking stuffers too!! Thanks for some great ideas. I’m adding some little oils and writing utensils in ours this year too. Love the hat and burts bees ideas too! 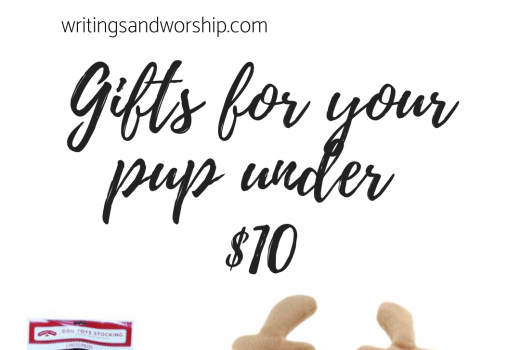 Cute gift ideas! Those sparkly earrings are my favorite, I might gift it to myself hehe. Hey, go for it girl! Love these stocking stuffer ideas! I always wait until the last minute and put candy and magazines in stockings. Boring! These are so much better! Thanks for sharing.